At a meeting where the Studiebarometeret survey was presented, HiMolde master’s students voiced a need for strategies to break down nationality circles in the classrooms . 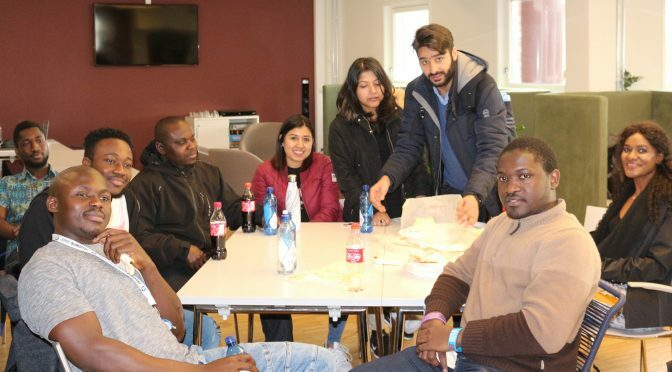 On the 20th of February all master’s students met in the campus canteen for a joint meeting to discuss their journey and experience as both national and internationals students. According to the satisfaction survey presented during the meeting – Studiebarometeret (link to survey results English), the Norwegian students at HiMolde are less involved in exchange programs offered by HiMolde than the average at other universities, and currently HiMolde is devising ideas and strategies to encourage participation. The master’s programs offered at HiMolde are structured to be flexible to allow students to work part time, and HiMolde also has long distance based master’s students. The statistics presented indicated that HiMolde students rate most of the courses currently being offered at master’s level are slightly below the national average. However, in Molde, master’s students are overall more satisfied than the bachelor’s students. The meeting gave students a platform to discuss their needs and expectations. “The university aims to offer students what they need educational wise and prepares them for the corporate world which is why we have courses among others; business cases, ERP with SAP, mathematical modelling, and seminars to offer students practical experience in solving real time corporate problems”, said prorector of HiMolde, associate professor Heidi Hogset. After enjoying free pizza “eat till you drop” and some refreshments, the students were divided into groups for each study program. The week before, the Supply Chain Management students already had met with associate professor Berit Irene Helgheim, who is the program director for the master’s students in Logistics. At the meeting, she addressed the students in as what most students would say a “strict yet loving manner’. She even made a joke that she cut her hair to look lenient. Helgheim mentioned that she is working on a summer internship program with local companies. She also gave a brief and detailed description about the structure of seminars to be offered next semester and encouraged students to start thinking and preparing for their research thesis. Helgheim talked about the exchange semester available at Brno University in Czechia and motivated those interested to start researching about the program. Helgheim concluded the meeting by encouraging students to work hard at all times. Some students said they want the university to come up with strategies that socialize national and international students more in order to get rid of the nationality circles that exist in the classroom setup, having Norwegian doing assignments on their own and other internationals on their own too. Other issues raised included the challenges of getting jobs during the study tenure and one student prompted the university to have strategic alliances with local companies – as many as possible. And also to create jobs on campus for students.